While most may think of the famous Swiss Army Knife when they hear Victorinox, the company has also made major strides when it comes to secure flash drives. At the Pepcom Digital Experience event at CES 2011, Skatter Tech had a chance to see the Victorinox Slim, Slim Duo, and Secure SSD. 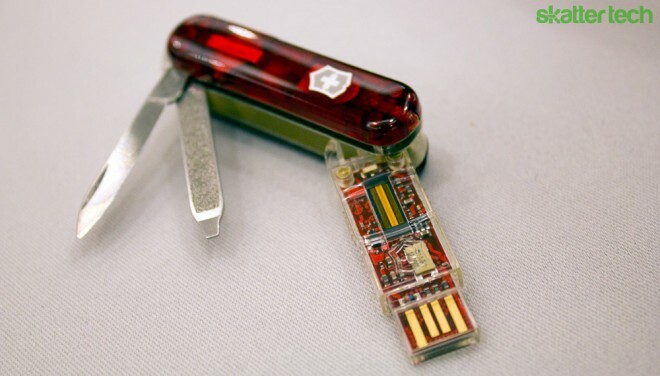 While many may find the company’s 256 GB slim solid-state drive that includes a Swiss Army Knife quite impressive, Skatter Tech also got a quick preview of a prototype that was still in the works. The team from Victorinox also briefly let us take a look at an upcoming 512 GB SSD flash drive that featured a mini e-Paper display which shows the owner’s name and available free disk space. Due to the eInk technology, the screen is “always-on” and doesn’t require any power. Like the already-available 256 GB SSD drive, the upcoming 512 GB model will also feature hardware data encryption and read/write speeds a few times faster than most flash drives on the market. While most flash drives merely work with a standard USB 2.0 port, the Secure SSD also fits into a eSATA II port for even faster data transfer rates. Although the Secure SSD is an amazing piece of technology, it’s a bit too expensive for the average person. Fortunately, the Slim and Slim Duo models offer a more-affordable solution. To keep in line with the Victorinox Swiss Army brand, both models feature a standard pocket knife features such as blades, nail files, and scissors. As a bonus, these also feature an LED white light, a ball point pen, and a screw driver. These are also waterproof, shock resistant, and available in various colors: red, silver, blue, pink, green, and orange. 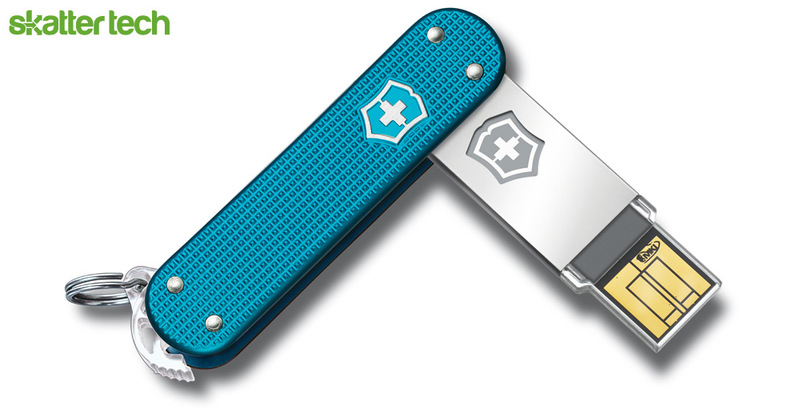 Victorinox offers the Slim in capacities reaching 64 GB while the Slim Duo can hold up to 128 GB. Like the IronKey we reviewed last year, Victorinox also includes a set of portable applications on board both the Secure SSD and Slim models. These include an automatic backup tool, an anonymous web browser, bookmark organizer, and a password manager. These flash drives can even synchronize backups of Microsoft Outlook and other files and folders. Unlike an off-the-counter flash drive, there’s no need to worry if one of these get lost or stolen since all data is completely encrypted. For those looking to grab either the Secure SSD or Slim model, be patient. The newly announced items won’t be available until at least March or April 2011. As for pricing, the Victorinox representatives that we spoke to stated that details had not been finalized just yet.